Forget cotton candy, caramel corn, and funnel cakes. If you’ve been to a fair or festival recently—the national calendar is clogged with dates in August and September—you know food offered on the midway has veered into “freak show” territory. Fried nuggets of pure butter, beer-battered dill pickles stuffed with hot dogs, and even deep-fried Kool-Aid. (Don’t ask.) With nearly everything on a stick. 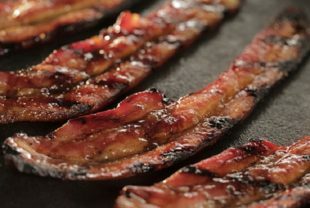 I couldn’t help myself: I started trolling newspapers, blogs, and the food press to find the most outrageous fair-type foods that could be replicated at home with a grill or smoker. There were many, but I’ve listed some of the best (and most doable) below. Have fun with them! 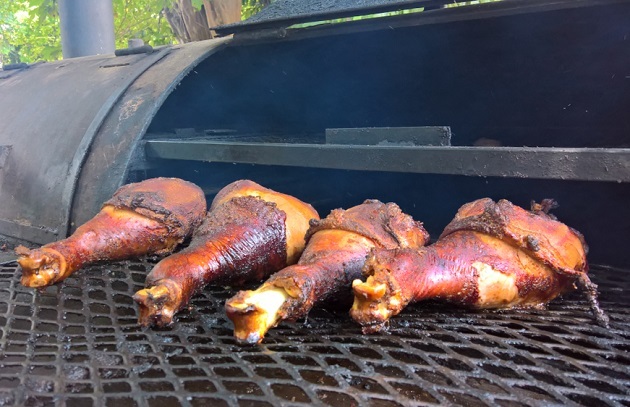 Smoked Turkey Legs: Flintstonian-size smoked turkey legs—some weighing as much as 2 pounds—were popularized by the Disney parks. But these ham-like meat clubs are easy to make at home. Simply brine the legs using the recipe from Steven’s Bourbon- and Maple-Brined Smoked Turkey, adding 2 tablespoons of Prague powder or other instant curing salt to the mixture. Submerge the turkey legs (at least 4 to make it worth your time) in the brine and refrigerate for 24 hours. Rinse the legs under cold running water, but do not dry. Set up your smoker or charcoal grill for smoking and heat to 275 degrees. Smoke the legs until the internal temperature is 175 degrees on an instant-read thermometer, 3 to 4 hours, depending on their size. If desired, crisp the skin over a medium-hot fire before serving. 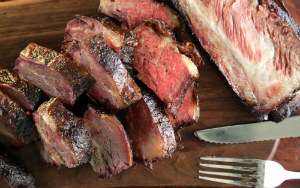 Smoked Roast Beef Sandwich: Cattle outnumber people by five to one in this Midwestern state, so it’s no surprise South Dakota’s Cattlemen’s Association sells up to 1,000 smoked roast beef sandwiches a day. For this sandwich—especially if you’re feeding a crowd—we recommend Steven’s recipe for barbecued shoulder clod. Add cheese and grilled onions and peppers, if desired. Belly Up Burger: Debuted by the Rib Shack, a vendor at the Iowa State Fair, this burger starts with a thick patty made from one-half pound of pork belly. It’s topped with sauced pulled pork, candied bacon, and coleslaw, and served on a bun. We suggest accompanying it with a homemade version of Pickle Pops—that is, frozen pickle juice. Simply insert Popsicle sticks in molds, fill with dill pickle juice (cut with a little sugar), and freeze until firm. Muddy Pigs: Weave thick slices of bacon or cured pork belly on bamboo skewers. Indirect grill at 350 degrees until cooked, about 25 minutes, depending on their thickness. Let cool, then dip in or slather with melted chocolate. We wouldn’t say no to a sprinkle of chopped dry-roasted peanuts (add before the chocolate hardens). Smoked Ice Cream: Because, why not? Steven’s been doing it for years. Add it to your repertoire and you’ll never look back. Barbecue Split (or Sundae): Construct the former in a shallow rectangular bowl (or banana split dish) using scoops of barbecued pulled pork, mac ‘n cheese, and coleslaw. Garnish with a pickle spear and a cherry tomato. 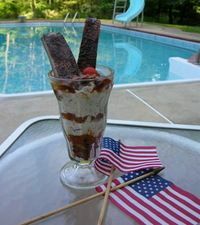 Make the latter by layering baked beans, pulled pork, and coleslaw in a sundae glass. Garnish with a barbecued rib and a cherry tomato. Pork Chop on a Stick: The pork producers’ tent at the Iowa State Fair sold 60,000 of their succulent 9-ounce, bone-in pork chops on a stick last year. If making these at home, we’d brine the chops (see the Maple and Bourbon brine above), make shallow knife cuts in the collars of fat to keep them from curling, then thread the chops on a rotisserie spit for grilling. About 1 hour of spinning should do it. Alternatively, indirect grill these thick chops until the internal temperature is at least 145 degrees. Impale through the side on a sturdy skewer or sharpened chopstick. By the way, you can make a variation of this using this recipe for Monroe County Pork Steaks with Spicy Vinegar Dip. Similar chops have been featured at the Kentucky State Fair for over 35 years. Reuben Burger: Omaha, Nebraska, claims to be the birthplace of the classic Reuben sandwich, so it’s no surprise that it inspires food vendors at the state fair. Here’s how they make in in Big Red country: Top a grilled beef burger with a slice of pastrami and Swiss cheese. When the cheese melts, transfer the stack of meat and cheese to a toasted bun. Top with drained sauerkraut and Russian or Thousand Island dressing. Mexican Grilled Corn: Grilled or roasted corn is an extremely popular snack in the nation’s corn belt. 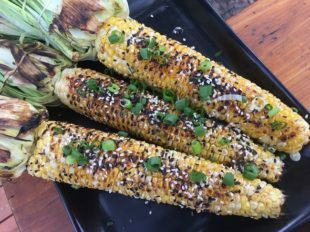 We recently shared several of our favorite grilled corn recipes in a blog, including elotes and others. Or, you can simply spiral thin-cut bacon around an ear of corn and direct grill it, turning frequently, until the bacon is crisp. Serve on a stick or sharpened chopstick if you want that fair vibe! Grilled Caesar Salad: Leave it to the Orange County fair in southern California to tempt fairgoers away from fried foods with a grilled salad. Actually, Steven posted a recipe many years ago for what now seems like health food, comparatively speaking. Find it here. Krispy Kreme Burger: Popular in several states, from Indiana to Alabama, is this too-good-to-look-away indulgence. Grill your favorite burger and use two glazed donuts in lieu of a hamburger bun. Have a fair-favorite to try at home? Tell us about it on Facebook, Twitter, or the Barbecue Board.